The Conservatoire supports the development of staff research through the Research Projects Fund, which is overseen by the Research & Ethics Committee. Below are some examples of recent projects. If you would like to get in touch with one of the researchers, please email our Assistant Registrar Sandra Surblyte who will direct you to the staff contact for research in the relevant school. The project arose from recognition that the School receives very few applications from students who are physically disabled, and a desire to make reasonable adjustments for disabled students even more effective. 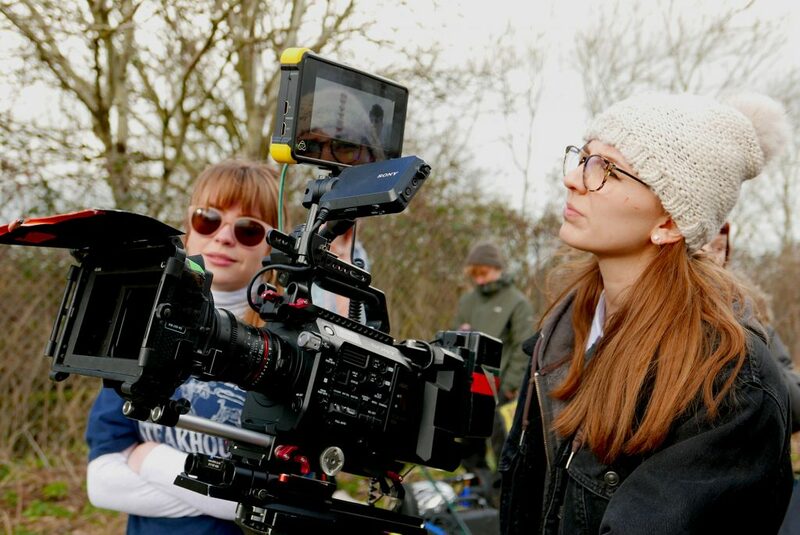 The project aims to research methods of both encouraging potential students to apply for acting courses, and in the longer term to adapt the school’s curriculum and teaching practices to serve all students more effectively. The initial Feasibility Study is designed to a) identify obstacles to potential students applying; b) seek advice on how best to work with disabled students – both within the physical environment of the School and through making adjustments to the curriculum and teaching practices; c) survey other drama schools and their provision for potential and current students who are disabled. 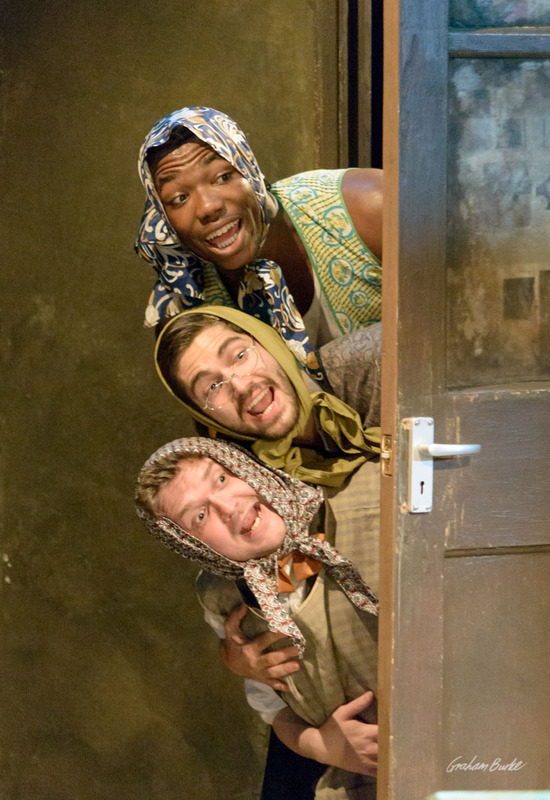 In 2018 Bristol Old Vic Theatre School presented an integrated production in collaboration with Bristol Old Vic and Diverse City. Jamie Beddard, an actor with disabilities, starred in a production of The Elephant Man by Bernard Pomerance alongside BOVTS actors and technical students in training. This three way collaboration explored the creative opportunities and challenges of integrated working and how this might cast a light on training students with disabilities. As part of this process, the development, rehearsal and performance process was documented and evaluated including a photographic record and interviews with participants. Through documentation and evaluation, this research aims to support ‘best practice’ in working in an integrated way with artists with disabilities in a professional setting. Research has clearly shown a correlation between fatigue and the risk of injury (Angioi et al 2009, Luke et al 2001). This project builds upon a previous in-house study with third year dance students, in collaboration with the University of Exeter and carried out at Central School of Ballet. For this second study, the interval training regime – a programme consisting of 12 minutes of interval training twice per week for a 12-week period – was repeated twice throughout the academic year. The study measured parameters including weight, hip:waist ratio, blood pressure, and heel bone density. The research aims to link with periodisation in dance training for the peaks and troughs that run throughout the year, and to reduce the risk of injury and minimise fatigue levels in pre-professional dancers. This project is intended as a precursor to a more in-depth project correlating with an injury profile, alongside looking with greater depth and sensitivity at bone health using DEXA scanning involving more reliable areas of the body which are particularly relevant to dancers. The purpose of the study is to see if reduced hip strength will predispose a dancer to lower limb injury. There is evidence of a correlation between hip strength and knee pain (Souza and Powers, 2009; Robinson and Nee, 2007). However, it is not known if the reduction in power seen in these studies were the cause of injury. The study uses a hand held Dynamometre to assess the strength of 4 hip movements. A single leg squat in neutral and in full turn out are used to assess functional weaknesses. Data collection takes place at the start and finish of the academic year, with an injury audit completed over the course of the year. The study aims to reduce the risk of injury to dancers by recognising areas of weakness that predispose an individual to injury, and using the results to guide injury prevention. This practice research explores urban space as a field of converging flows and energies that comprise our lived experience – a field increasingly vibrating between the ‘virtual/screen-based’ and the ‘real’. Using video conferencing to simultaneously link dance artists in three different city sites across the globe, the project experiments with performing a hybrid ‘local’ residing in the virtual screen-space the technology facilitates. Being alive (and the sense of meaning and continuity that derives from having a life) is understood as an on-going act of movement through and as part of multi-layered, rhizomatic, and interconnected system-assemblages in space and time. The city manifests a particularly potent nexus of this situation. Movement implies having a material body but equally implicates the immaterial or virtual self. The virtual/screen-based life is ubiquitous for many urban humans; nevertheless, we have physical bodies – what happens in the phase shifts between the physical and virtual? Where do we actually live? This project aims to create new knowledge through a practice-research process, employing dance/performance expertise, technology, and a site-specific methodology. urbanflows (screen experiment:1) was presented as a Skype-enabled screen improvisation during PSi#24 Daegu (Performance Studies International Conference) in South Korea, July 2018. The image is a screen still from the project. The project researched the intersection between Nodine’s long-term practice of teaching and making choreography which integrates voice and movement, with a visual arts approach to installation-making. The intention was to expand the audience’s perception of the body of a performer into a visual and aural environment through collaboration with Sound Designer Jamie McCarthy and Lighting Designer Gareth Green. Ultimately, the research investigated ways of stimulating an audience’s awareness of their own body and breath via the performers by means of kinaesthetic empathy. The project aimed to reverse the current trend in the visual arts of the presence of dance in galleries and museums, instead appropriating the strategies of installation art in order to interrogate the choreographic process. This studio-based practice-as-research project explores the nature of choreographic process and cross-arts source material approaches to performance. The project aims to stimulate consideration and discussion around movement motivation, discovery and making and to raise enquiry and debate around perceptions and attitudes towards performance and the performer. The second phase of the project, Skin/Space/Stone, developed the research into an extended form for presentation at dance institutes, conferences and choreographic festivals. After the initial exploration process, sharings were given at Ideas In Action at London Contemporary Dance School, Movingeast and SDD studios. Skin/Space/Stone was performed on 4 June 2017 in Hong Kong during the Hong Kong International Choreography Festival (HKICF). The work was also shown as part of the student conference at LCDS on 7 June and at Rambert School on 9 June. Samuel Wilson is editor of a collection of essays, Music – Psychoanalysis – Musicology, on the adoption of psychoanalytic theory into methods of understanding music. The music discussed ranges from Franz Schubert to Taylor Swift. It explores music with reference to a rich body of interdisciplinary theory developed across psychoanalysis and the arts. This is the first collection of its kind; previous collections have been written by psychoanalysts with an interest in music but never by music specialists drawing on psychoanalytic theory (previous contributions in this subdiscipline are scattered throughout the literature). The book includes an introduction by Wilson on historical music-psychoanalysis connections and a chapter on the position of “the subject” in psychoanalytic interpretations of artworks and musical works. 9 minutes directed by Jorge Crecis, to be co-created and performed the postgraduate students of LCDS (EDge) and RADA (MA Theatre Lab) as well as the BA3 students at National Centre for Circus Arts at the end of the academic year 2018-19. It will be a multidisciplinary piece that will exhaust the physical, technical and emotive limits of each discipline and unique skill sets of each company. The initial research & development phase for this creation allows time to explore innovative ways to cross the disciplines of dance, theatre and circus. Generating written scripts whose content and rhythmicality are not only inspired but also specifically written to be performed alongside specific dance vocabularies and/or specific circus skills. Approaching choreography from a circus perspective; stage direction from a choreographic viewpoint; and circus devising by narrative. 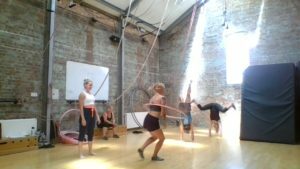 In July 2018 Cyr wheel students from National Centre for Circus Arts and students from London Contemporary Dance School had the opportunity to relate their practices and advance in understanding how another technique feeds creative approaches and opens new pathways towards technical integration and skills. This project serves to give Cyr wheel and Contact Improvisation (CI) practice a visibility and access through documentation and publication. It also initiates cross-disciplinary research as a tool to deepen artistic practices. To find out more about the research, visit the blog Cyr Seeks Contact. This project builds upon anecdotal evidence and conversations regarding the construction of gender in modern circus. It aims to create a greater understanding of gender in circus supported by a critical approach and analysis of the work currently being made within the sector. The work also aims to demonstrate that gendered representation within society has far-reaching effects, including within the modern circus. There are two elements to the research. The first stage is a gendered analysis of an internal resource, the ‘Artists Company and Development’ newsletter which is produced weekly and received by around 650 individuals, investigating language usage in job offers and the gendered narratives presented in advertised shows. The second stage, focusing on female jugglers, navigates concepts of essential, cultural and biological difference through a series of interviews. It explores the representation of women in a predominantly male environment, and the boundaries placed around participation. Voice is underexplored in Circus training and performance, with priority given to the virtuosic body. This focused research agenda questions why this might be and aims to lead Circus Arts towards new insights in voice applied to physical disciplines. Creatively how to enable the cross art form of voice circus to flourish. The creative practice as research experimented with voice techniques alongside static trapeze techniques, observing how the voice is affected by the trapeze physicality and how the trapeze skill is affected by the use of the voice. Workshops with National Centre for Circus Arts students looked at the well being of the performer using voice and circus disciplines, techniques for engaging the voice and creative applications with juggling, straps, hula hoop and handstands. Underpinning the practice was initial historical research which raised many points regarding the speechlessness and otherwise of circus and clowns. There will be an article documenting Phase 1, published soon. Phase 2 of the research will look at contemporary, phenomenological consideration and contextual analysis of The Circus Voice as well as developing studio practice and relating this to pedagogical and directorial methods for working with the voices of circus performers. Some experiences are hard to teach, learn, and capture, particularly when individuals are young and inexperienced. This project involved working with second year students at Rambert School within one specific module – performance and choreography – where 50% of the assessment is for a reflective piece of work. The research aimed to improve the quality of the students’ reflection, and give them tools that will enhance their future work in their final year and in their professional careers. Students were guided in using modelling, drawing, material objects, and movement, to help them learn how to reflect and express their reflections and choreographic ideas. 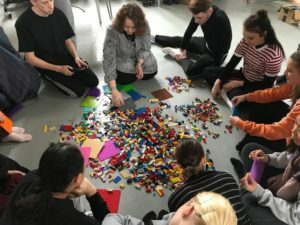 An introduction to theoretical models of reflection and creative approaches gave the students a vocabulary and allowed them to access and express their emotions and feelings in a way that cannot be gained through words alone. A filmographer documented the process of the students learning to reflect in this way. 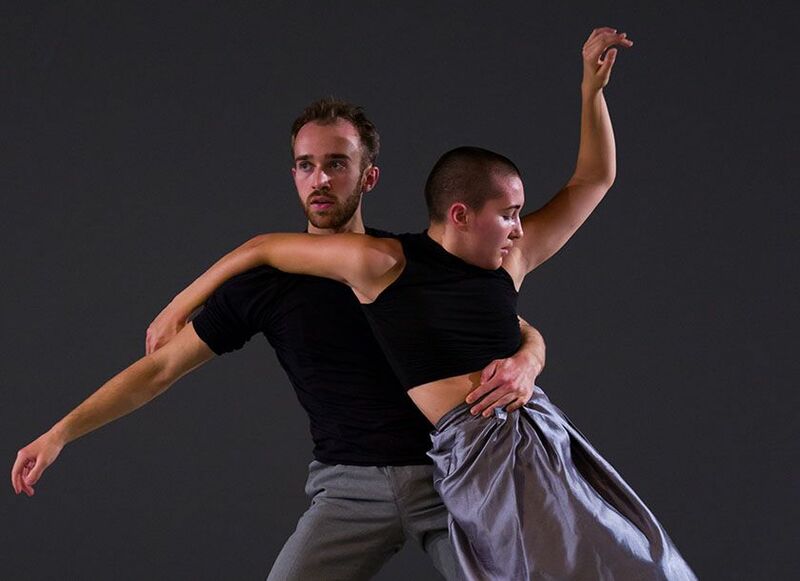 This project has two strands connected by a strong lineage within movement training at LAMDA. It aims to collate and document vital training methods that at present survive purely in a physical sense, through the bodies and teaching of a few practitioners. The first strand is the collation of a body of movement work by Trish Arnold, whose progressive and dynamic movement training began at LAMDA in the 1960s and has been passed down through the bodies of Jane Gibson and Elizabeth Ballinger, amongst others. The second strand features the notes from a two year mentorship, funded by LAMDA, between Jane Gibson and Elizabeth Ballinger. The research will interrogate what is the most effective way of documenting, displaying and sharing the work of Trish Arnold and Jane Gibson, two practitioners who have such a profound influence, not only on movement training at LAMDA but in theatre more widely. The central objective of the project was to produce a ‘road-tested’ performable and publishable translation of a Spanish Golden Age play, specifically Lope de Vega’s El cuerdo loco, entirely unknown in English but hailed in the Spanish-speaking world as ‘Lope’s Hamlet’. The translation emerged from an innovative collaborative process involving MA students as co-creators in a series of workshops. The students developed a translational strategy together before undertaking translations of allocated scenes in smaller groups, then regrouped to finalize their translation. The project will lead to publication of a play by a playwright who is increasingly commanding the attention of British directors and critics. Publication will include an introduction on the scope, method, and translational/dramaturgical implications of the project, produced jointly by Cherns and Johnston. An initial feasibility study was undertaken to explore the potential for a wider, cross-school project investigating incidence of laryngeal pathology in a cohort of acting students. This project would provide an objective view of the laryngeal status of new acting students at the beginning of their training via scoping. By obtaining objective data, current laryngeal disorders will be identified, the student educated and any appropriate intervention instigated. The current system of subjective judgement is open to individual interpretation, which means cases will be missed, examination can be delayed and intervention instigated late. Objective scoping will provide the student and staff with confidence of knowing the result, understanding future management (which increases compliance) and will highlight the importance of the voice to students at an early stage in their training. The research would result in more effective management of students with laryngeal issues, with timely and appropriately focussed intervention. This will enable the student to get the best out of the training and for staff to be able to amend and manage their input so that it is appropriate to the needs of the student. Building on thirty years of teaching experience in the field, the project will document a number of historical dances to create a resource geared specifically towards actors. This resource will include an overview of the subject and will document 20 dances spanning the Medieval, Italian Renaissance, Elizabethan and 17th and 18th centuries. Descriptions will include comprehensive diagrams, floor patterns, and a single melody line of music to accompany each dance. The resource will enhance the learning experience and provide a permanent reference, as well as feeding into a classical actor’s essential physical training. The research aims to develop new methods of annotation and dissemination of existing knowledge in historical dance, clarifying ambiguities in ancient documents, and bringing a fresher, more ‘user friendly’ approach into play. It will also provide guidance on the practical assimilation and teaching of the steps and floor patterns, taking into account the training strategies developed through Scrivener’s work. The project centred on a piece of performance as research: contextualised, documented and examined to facilitate wider dissemination. The development of a treatment and revival of Bury Fair by Thomas Shadwell was plotted through its various stages from editing the original script to the creation of a new performing edition that speaks to audiences of today. The project took an experimental approach in the way in which it revitalised an under-recognised writer through an embodied, muscular approach to produce both a new product (the play text) and a new process (the approach to this under-examined text). A research publication will document the process from dramaturgical work through rehearsal process and to performance. This paper will examine both the process of editing and rehearsing the play and consider the project in the context of Restoration performance practices and critical debates about style, as well as Shadwell’s critical reputation. This project entails stakeholder research and development in relation to a new drama about the limits of free speech and the freedom to offend, in conjunction with academics at the cutting edge of free speech research. The process of development involves a number of draft development discussions, rehearsed readings and post-reading discussions as the play evolves. These include a workshop seminar with Dr Williams and the company of actors, a rehearsed reading and post-reading discussion at the University of Essex for an invited group of academics and students, and a further reading and post-reading debate of the final draft. The project aims to bridge the gap between the artistic exploration of writer, director and student actors, the research community and stakeholders in a series of intellectual and artistic encounters; developing relationships with academics by situating the artistic work of a conservatoire in the context of academic debate. This project will provide insight into the use of vocal amplification in non-musical UK theatre, including reasons, trends and views, and consider its implications for actor training. Amplification seems to be on the increase, yet it was cited by some commentators as a reason for the curtailment of Emma Rice’s work at the Globe. Is it a simple solution or a contentious mutation? If actors’ voices will no longer need to fill larger performance spaces, why would their vocal training need to have this as an aim? Through interviews with a range of practitioners, including directors, actors, artistic directors and sound designers, and assessment of amplification use and impact in and on current plays, the projects aims to uncover new insights into an area of theatre performance where currently there is limited information. Dark Clown is an innovative form based on a body of independent practical research work largely in the form of performance and pedagogic practice begun in the mid-1980s. Dark Clown work provides a way to extend the physical and psychophysical practice of the Actor, Dancer and Circus Practitioner. It provides a way to create Clown characters with contemporary relevance and to create a more dynamic rapport with audiences, while also encouraging a broader look at humanity. Around 1,000 people have tasted Dark Clown as a workshop experience and productions have been mounted in this style. This research project gives an outline or insight into the pedagogy – showing how comic craft learned in Red Nose Clown gets extended into the darker context of the Dark Clown work. It also marks the first substantial documentation of key Dark Clown Scenarios which have been developed over the years to articulate and bring the form to life. The resulting film includes excerpts of interviews with the weekend participants as they reflect on the work and its possible applications to theatre practice. This documentation provides a way for a wider audience of practitioners to get a more detailed sense of the performance possibilities and the dramatic potential of this unique form. This project focuses on working with early modern drama using actors who have chosen to work in physical theatre. The research questions whether physical theatre is appropriating interpretation of text-based poetic drama, the role of interpretation between the physical and text, and the balance that is struck in this form of work in relation to early modern text. The context for the research is the work of companies including DV8, Tanztheatre Wuppertal-Pina Bausch, and the French tradition of pantomime. The project draws specifically on the work of practitioner Lindsay Kemp: dancer, actor, mime artist and choreographer. This project is a subset of a larger research project running in collaboration with Queen Mary, University of London, where Visnevski is an Honorary Research Fellow. The project aims were twofold: to develop practice-based research work – a practical exploration into the related phenomena of kinetics and spatiality, featuring interdisciplinary artistic practice – on a new piece of contemporary dance, Peregrinus, which was in its early stages; as well as to develop further and disseminate new dramaturgical practices. This project is about pilgrimage as an actual activity, as well as a spiritual and/or metaphorical journey, and a common human experience. The research reflects the need to investigate spaces that are held to be of great significance and the physical actions and gestures that are executed in these spaces. Is our movement subject to certain organisations/frameworks? In our secular society is there anything left that can be regarded as ‘sacred’? If so what is this movement/choreography that takes place and becomes visible; and how does one inhabit one’s body within certain assigned contexts of significance, whether internally or externally assumed? How does dance dramaturgy enable unfolding processes? How can de-centered dramaturgy be applied to practice? 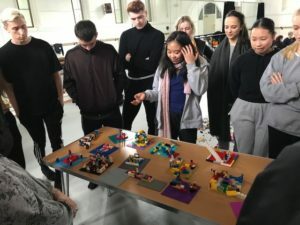 The research project culminated in a three-hour workshop on collaborative processes at RADA GBS Studio (held on 8 June 2016), exploring how devisers and dramaturgs can work together successfully. The workshop was designed for those who are working (or interested in working) with collaborative practices (devising, performance art, dance theatre, new circus) and are interested in new dramaturgy, “where the meaning, the intentions, the form and the substance of a new piece arise during the working process” (Van Kerkhoven), and either want to work as dramaturgs or want to work with dramaturgs in these processes. The participants from two Conservatoire schools, augmented by members of the Dramaturgs’ Network, were investigating the various stages of the performance-making process and discussing where and why things could possibly go wrong, in order to ‘fail better’ next time.